Next Row - 3ch, 1tr into next tr, * make 1ch, miss 1ch, 1tr into each of next 2tr, * rpt from * to * to end, working last tr into top of 3ch. Turn. Edging - 1ch, 2dc into base of 1ch, 1dc into each tr and 1ch space to 3ch to turn with, 3dc into top of 3ch, working down side of headband, work 2dc into each row end to next corner, 3dc into corner, working along cast on edge work 1dc into each ch to next corner, 3dc into corner, work 2dc into each row end up second side of headband to corner, 1dc into corner, ss to first dc. Fasten off. Finishing - Weave in loose ends of yarn, attach button to end and fasten through gaps in tr's. Starting with 1ch and turning at the end of each row work 13 more rows of dc. Turn. Fold work in half length ways, using back loop of dc and working into each of the starting ch, ss last row and cast on edge together to make a round. Fasten off. Weave in ends and turn through to RS. Starting with 1ch and turning at the end of each row work 6 more rows of dc. Turn. Fold centre band around bow length ways, using back loop of dc and working into each of the starting ch, ss last row and cast on edge together to make a round (you will need to pull quite tight to make ends meet. Fasten off. Weave in ends and turn seam onto inside, attach bow to headband. 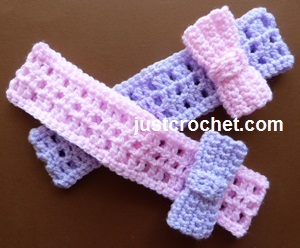 Hope you enjoy this free baby crochet pattern for a headband with a bow.